- The customer can use maximum 3 codes per day. - Please kindly notice that the code exists 160,000 minutes, after the existing time the promotion code will be automatically canceled in the system. - After the first code is validated, the next code is received after 1 minute. - Each Imei TV can use maximum 3 codes in the whole promotion. - Term: from 15/05/2017 until 31/12/2017 or until all 5.000 promotion codes are given out. - Not applicable to purchasing online and delivery. - Apply to all Mon Hue Restaurants. 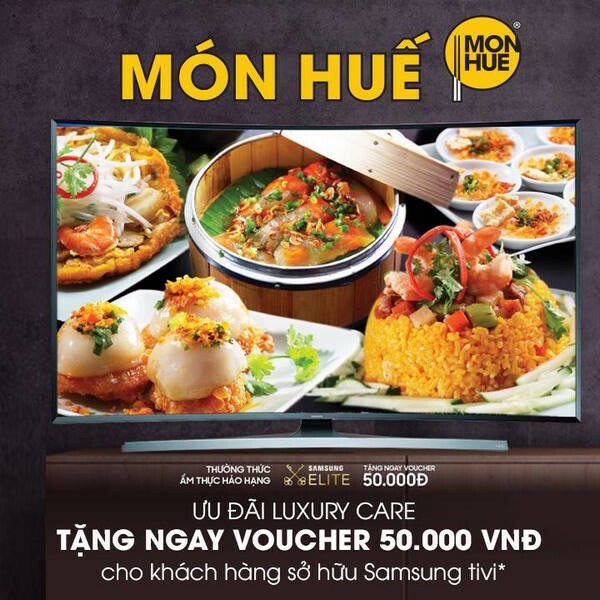 Let’s quickly take this chance to receive vouchers and enjoy the sophisticated cuisine at Mon Hue restaurant chain nationwide.